Guess I am more or less ready to wrap up my research on QM. Here is the exact status as of today. As to the actual case of two interacting particles (i.e., the interaction term in the Hamiltonian for the helium atom), I think that my approach should come to reproduce the same results as those obtained using the perturbation theory or the variational approach. However, I need to verify this part via discussions with physicists. All in all, I do think that the task which I had intended to complete (and to cross-check) before this month-end, is already over—and I find that I don’t have to give up on QM (as suspected earlier [^]), because I don’t have to abandon my new approach in the first place. To me, the crucial part at this stage (i.e., for the second-half of March) was verifying whether working with the two ideas of (i) a wavefield, and (ii) electrons as “particles” having definite positions (or more correctly, as points of singularities in the potential field), still leads to the same mathematical description as in the mainstream (linear) quantum mechanics or not. I now find that my new approach leads to the same maths—at least for the QM of the non-interacting particles. And further, I also have very definite grounds to believe that my new approach should also work out for two interacting particles (as in the He atom). The crucial part at this stage (i.e., for the second half of March) didn’t have so much to do with the specific non-linearity which I have proposed earlier, or the details of the measurement process which it implies. Working out the details of these ideas would have been impossible—certainly beyond the capacities of any single physicist, and over such a short period. An entire team of PhD physicists would be needed to tackle the issues arising in pursuing this new approach, and to conduct the simulations to verify it. Of course, the Outline document (which was earlier uploaded at iMechanica, on 11th February 2019) [^] needs to be revised extensively. A good deal of corrections and modifications are in order, and so are quite a few additions to be made too—especially in the sections on ontology and entanglement. However, I will edit this document at my leisure later; I will not allocate a continuous stretch of time exclusively for this task any more. In fact, a good idea here would be to abandon that Outline document as is, and to issue a fresh document that deals with only the linear aspects of the theory—with just a sketchy conceptual idea of how the measurement process is supposed to progress in a broad background context. Such a document then could be converted as a good contribution to a good journal like Nature, Science, or PRL. Coming to the skepticism shown by the couple of physicists (with whom I had had some discussions by emails), I think that, regardless of their objections (hollers, really speaking! ), my main thesis still does hold. It’s they who don’t understand the quantum theory—and let me hasten to add that by the words “quantum theory,” here I emphatically mean the mainstream quantum theory. It is the mainstream QM which they themselves don’t understood as well as they should. What my new approach then does is to merely uncover some of these weaknesses, that’s all. … Their weakness pertains to a lack of understanding of the correspondence in general, for any kind of physics: classical or quantum. … Why, I even doubt whether they understand even just the classical vibrations themselves right or not—coupled vibrations under variable potentials, that is—to the extent and depth to which they should. In short, it is now easy for me to leave their skepticism alone, because I can now clearly see where they failed to get the physics right. 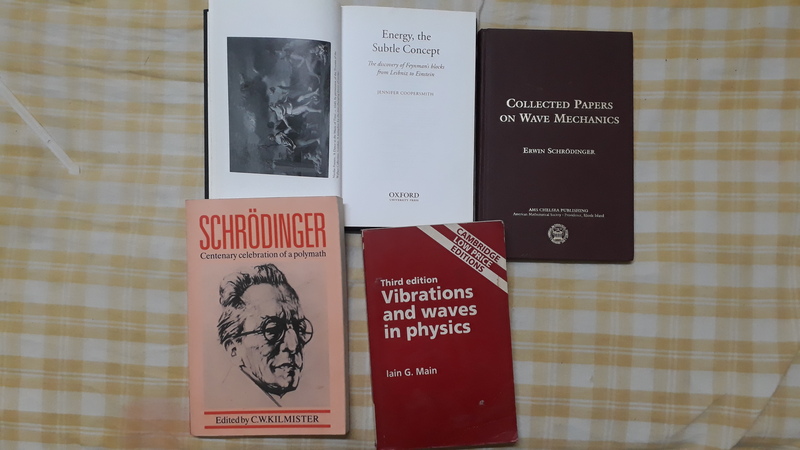 In the near future, I would like to make short trips to some Institutes nearby (viz., in no particular order, one or more of the following: IIT Bombay, IISER Pune, IUCAA Pune, and TIFR Mumbai). I would like to have some face-to-face discussions with physicists on this one single topic: the interaction term in the Hamiltonian for the helium atom. The discussions will be held strictly in the context that is common to us, i.e., in reference to the higher-dimensional Hilbert space of the mainstream QM. In case no one from these Institutes responds to my requests, I plan to go and see the heads of these Institutes (i.e. Deans and Directors)—in person, if necessary. I might also undertake other action items. However, I also sincerely hope and think that such things would not at all be necessary. There is a reason why I think so. Professors may or may not respond to an outsider’s emails, but they do entertain you if you just show up in their cabin—and if you yourself are smart, courteous, direct, and well… also experienced enough. And if you are capable of holding discussions on the “common” grounds alone, viz. in terms of the linear, mainstream QM as formulated in the higher-dimensional spaces (I gather it’s John von Neumann’s formulation), that is to say, the “Copenhagen interpretation.” (After doing all my studies—and, crucially, after the development of what to me is a satisfactory new approach—I now find that I no longer am as against the Copenhagen interpretation as some of the physicists seem to be.) … All in all, I do hope and think that seeing Diro’s and all won’t be necessary. I will be able to undertake editing of the Outline document (or leaving it as is and issuing a fresh document) only after these discussions. The bottom-line is that my main conceptual development regarding QM is more or less over now, though further developments, discussions, simulations, paper-writing and all can always go on forever—there is never an end to it. So, I now declare that I am free to turn my main focus to the other thing that interests me, viz., Data Science. I already have a few projects in mind, and would like to initiate work on them right away. One of the “projects” I would like to undertake in the near future is: writing very brief notes, written mainly for myself, regarding the mathematical techniques used in data science. Another one is regarding applying ML techniques to NDT (nondestructive testing). Stay tuned. This post directly continues from my last post. The content here was meant to be an update to my last post, but it grew, and so, I am noting it down as a separate post in its own right. Questions will be OK, even encouraged, but the format will be that of a typical engineering class-room lecture. Discussions would be perfectly OK, but only after I finish talking about the “syllabus” first. The talk should preferably be attended also by a couple of PhD students or so (of physics/engineering physics/any really relevant discipline, whether it’s acknowledged as such by UGC/AICTE or not). They should separately take down their notes and show me these later. This will help me understand where and how I should modify my notes. I will then myself finalize my notes, perhaps a few days after the talk, and send these by email. At that stage, I wouldn’t mind posting the notes getting posted on the ‘net. Guess I will think a bit more about it, and note about my willingness to deliver the talk also at iMechanica. The bottom-line is that I am serious about this whole thing. No, as far as QM is concerned, the approach I took in my PhD time publications is not at all relevant. I have completely abandoned that track (I mean to say as far as QM is concerned). However, my PhD time research on the diffusion equation has been continuing, and I am happy to announce that it has by now reached such a certain stage of maturation/completion that I should be writing another paper(s) on it any time now. I am happy that something new has come out of some 10+ years of thought on that issue, after my PhD-time work. Guess I could now send the PhD time conference paper to a journal, and then cover the new developments in this line in continuation with that one. Coming back to QM: Any one else could have easily got to the answers I have. But no, to the best of my knowledge, none else actually has. However, it does seem to me now that time is becoming ripe, and not to stake a claim at least now could be tantamount to carelessness on my part. Yes, my studies of philosophy, especially Ayn Rand’s ITOE (and Peikoff’s explanations of that material in PO and UO) did help me a lot, but all that is in a more general sense. Let me put it this way: I don’t think that I would have had to know (or even plain be conversant with) ITOE to be able to formulate these new answers to the QM riddles. And certainly, ITOE wouldn’t at all be necessary to understand my answers; the general level of working epistemology still is sufficiently good in physics (and more so, in engineering) even today. At the same time, let me tell you one thing: QM is very vast, general, fundamental, and abstract. I guess you would have to be a “philosophizing” sort of a guy. Only then could you find this continuous and long preoccupation with so many deep and varied abstractions, interesting enough. Only then could the foundations of QM interest you. Not otherwise. To formulate answers, my natural proclivity to have to keep on looking for “physical” processes/mechanisms/objects for every mathematical idea I encounter, did help. But you wouldn’t have to have the same proclivity, let alone share my broad convictions, to be able to understand my answers. In other words, you could be a mathematical Platonist, and yet very easily come to understand the nature of my answers (and perhaps even come to agree with my positions)! But, to arrange for my talk is not to be willing to certify or validate its content. Not at all. Once again, the issue is best clarified by giving the example. Check out how people treated me at iMechanica. If you are at an IIT/IISc/similar institute/university and are willing to treat me similarly, then do think of calling me over. NASA’s EM drive has made it to the Forbes. Brian Koberlein, an astrophysicist who teaches at the Rochester Institute of Technology, provides a decent coverage; see, here [^]. First things first. I hardly know anything about the EM drive. Yes, I did go through the news reports about it a week ago or so, but about the only salient thing I noticed was that it was a replication of a result. The original result itself was found by the physicists community to be, to make an understatement, something like absolutely enormously incredible. … Given NASA’s reputation (at least among the physicists community), therefore, the scene would be ripe for quite some energetic speculations—at least discussions. Newsworthy. But still, I myself don’t know much about the experiment. Not even a schematic sketch of the apparatus was provided in the general news coverage about the experiment so far, and I didn’t look into the paper itself because I knew it would be beyond me. But since it was the Forbes where Koberlein’s coverage appeared, I decided to go through it. The description would be dumbed down enough that even I could get something out of it, I thought. In the usual Copenhagen interpretation of quantum theory, an object is defined by its wavefunction. The wavefunction describes the probability of finding a particle in a particular location. The object is in an indefinite, probabilistic state described by the wavefunction until it is observed. When it is observed, the wavefunction collapses, and the object becomes a definite particle with a definite location. Still, I did have an issue here. It is in the very last sentence in the quoted passage. As you know, I have been writing and re-writing, and arranging and re-arranging the “syllabus” for my planned “book” on QM. In particular, these past few days, I have been doing exactly that. Since the subject matter thus was fresh in my mind, I could see that the way that the QM was developed by the original masters (Heisenberg, Schrodinger, Pauli, …), the spirit of their actual theorization was such that the last sentence in the quoted passage could not actually be justified. Even though the usual mainstream QM presentation proceeds precisely along those lines, the actual spirit of the theorization by the original founders, has begun looking different to me. I am not saying that Koberlein’s last sentence is not a part of the Copenhagen interpretation. I am also not saying that Heisenberg did not have the Copenhagen interpretation in his mind, whenever he spoke about QM (as in contrast to discovering and working on QM). I am also aware that Schrodinger wanted to get rid of the quantum jumps—and could find no way to do so. Yet, what I am saying is this: Given my self-study of QM using university text-books (like McQuarry, Resnick, Griffiths, Gasiorowicz, …), esp. over the last year, I can now clearly see that the collapse postulate wasn’t—or shouldn’t have been—a part of the spirit of the original theory-building. Since I am dwelling on the spirit of the original (non-relativistic) QM, it is relevant to point out to you to someone who has putting up a particularly spirited defence of it over a period of time. I mean the Czeck physicist Lubos Motl. See, for example his post: “Stupidity of the pop science consensus about `many worlds’ ” [^]. Do go through it. Highly recommended. I know that Motl often is found involved in controversies. However, in this particular post (and the related and similar posts he has been making for quite some time), he remains fairly well-focused on the QM itself. He also happens to be extraordinarily lucid and clear in this post; see his discussion of the logical OR vs. the logical AND, for instance. Even though Motl seems to have been arguing for the original founders, if you think through his writings, it also seems as if he does not place too much of an emphasis on the collapse postulate either—even though they did. He in fact seems to think that QM needs no interpretation at all, and as I suppose, this position would mean that QM does not need the Copenhagen interpretation (complete with the collapse postulate) either. No, considering all his relevant posts about QM over time, I don’t think that I can agree with Motl; my position is that QM is incomplete, whereas he has strongly argued that it is complete. (I will come to show you how QM is incomplete, but first, I have to complete writing the necessary pre-requisites in the form of my book). Yet, I have found his writings (esp. those from 2015-end) quite helpful. The detour to Motl’s blog was not so much of a detour at all. Here is another post by Motl, “Droplets and pilot waves vs. quantum mechanics” [^], done in 2014. This post apparently was in response to Prof. Bush (MIT) et al’s droplets experiment, and Koberlein, in his Forbes story today, does touch upon the droplets experiment and the Bohm interpretation, even if only in the passing. As to me, well, I have written about both the droplets experiment as well as Bohm’s theory in the past, so let me not go there once again. [I will add links to my past posts here, in the revision tomorrow.] As a matter of fact, I sometimes wonder whether it wouldn’t be a good idea to stop commenting on QM until my book is in at least version 0.5. The pilot wave model handles quantum indeterminacy a different way. Rather than a single wavefunction, quanta consist of a particle that is guided by a corresponding wave (the pilot wave). Since the position of the particle is determined by the pilot wave, it can exhibit the wavelike behavior we see experimentally. In pilot wave theory, objects are definite, but nonlocal. Since the pilot wave model gives the same predictions as the Copenhagen approach, you might think it’s just a matter of personal preference. Either maintain locality at the cost of definiteness, or keep things definite by allowing nonlocality. But there’s a catch. Although the two approaches seem the same, they have very different assumptions about the nature of reality. No, Brian, they are the same—inasmuch as they both are essentially non-local, and give rise to exactly the same quantitative predictions. If so, it’s just us who don’t understand how their seemingly different assumptions mean the same underlying physics, that’s all. Writing the book itself can start any time now, though by now I clearly know that it’s going to be a marathon project. Months, in the least, it will take for me to finish. Also, don’t wait for me to put up parts of it on the Web, any time soon. … It is a fact that I don’t have any problem sharing my drafts before the publication of the book as such. Yet, it also is a fact that if every page is going to be changing every day, I am not going to share such premature “editions” publicly either. After all, sharing also means inviting comments, and if you yourself haven’t firmed up your writing, comments and all are likely to make it even more difficult to finish the task of writing. But yes, after thinking off-and-on about it for years (may be 5+ years), and after undergoing at least two false starts (which are all gone in the HDD crashes I had), I am now happy about the shape that the contents are going to take. More, may be later. As to the Song I Like section, I don’t have anything playing at the back of my mind right away, so let me see if something strikes me by the time I come back tomorrow to give a final editing touch to this post. In that case, I will add this section; else, not!